Meet the increasing demand for modernized documentation for PDF and online help outputs. Import Adobe® FrameMaker® content into a flexible authoring and content management solution. Maintain stylistic and visual consistency of documentation across different outputs. Reduce production time and improve the automation of tasks. Reliable Consistency – Intelerad uses conditions, snippets and TOCs to ensure consistency throughout its documentation. The team also maintains visual, stylistic and organizational consistency with stylesheets. Innovation – MadCap Flare’s lack of proprietary formats and support for plain XML and HTML allow the team to create tools and further extend their use of Flare. Ease of Collaboration – Topic-based authoring with MadCap Flare streamlines communications and enhances transparency among writers. Reduced Production Time – Improvements in the workflow and automation of the production and review process using MadCap Flare have reduced production time from two weeks to less than one week. Intelerad Medical Systems Incorporated is a leader in medical image management and enterprise workflow solutions and services for medical organizations and healthcare professionals. Hospitals, imaging centers, and teleradiology clinics around the world rely on Intelerad to deliver high-quality patient care. 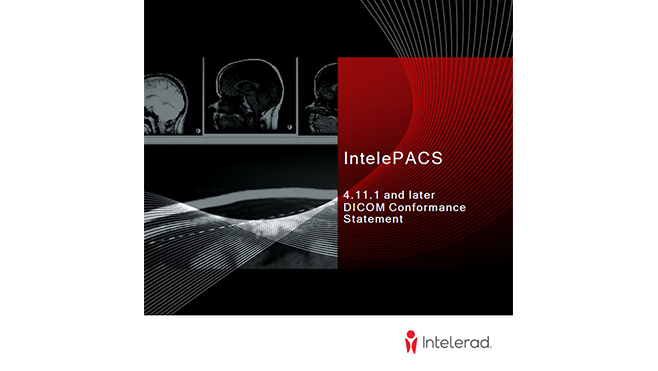 Among Intelerad’s extensive suite of scalable and flexible solutions is IntelePACS, a distributed radiology system for storing, retrieving and routing medical images. Because access to these images is critical for understanding patients’ health, writers at Intelerad put a priority on delivering manuals, quick reference cards, and online help that enable healthcare customers to make effective use of the system. Today, Intelerad depends on the topic-based authoring and single-source publishing of MadCap Flare to ensure the consistency of information about IntelePACS no matter how their healthcare customers decide to access it. For years, the team at Intelerad relied on structured FrameMaker® to create online help and PDF documentation. In addition to customer-facing documentation, such as PDF manuals, reference cards, and online help, the team was also tasked with creating standards documents, technical notes, and other collateral. Not only were they writing user documentation for frequent software releases, they also needed to support requests from other departments in the company. As Intelerad’s documentation grew, there was a growing need for an authoring solution that could keep pace with the writers’ demands. In the past year alone, we’ve reduced production time from two weeks to less than one week. We’re delighted that this curve keeps diving, and we’re now at the brink of reducing that to possibly hours. At Intelerad, the power to create and manage flexible documentation has always been a priority for the team. When considering the criteria for a new solution, the writers had a future vision for their workflow. During the evaluation and assessment process, MadCap Flare fit many of their prerequisites, and offered additional capabilities. Since the entire team would be migrating to new software, ease of use was a key requirement. The writers needed the ability to build their own internal training and support migration internally. The means to create documentation in a wide range of formats, such as plain XML and HTML, was another reason why Intelerad was drawn to MadCap Flare. This allowed the team to view Flare as a tool that would fit seamlessly into their documentation tool set and integrate with open source options. We write once, publish for different deliverables, and Flare gives us consistent results each time. We can depend on Flare to do that. Today, the team uses MadCap Flare to deliver content in a variety of formats to customers around the world. 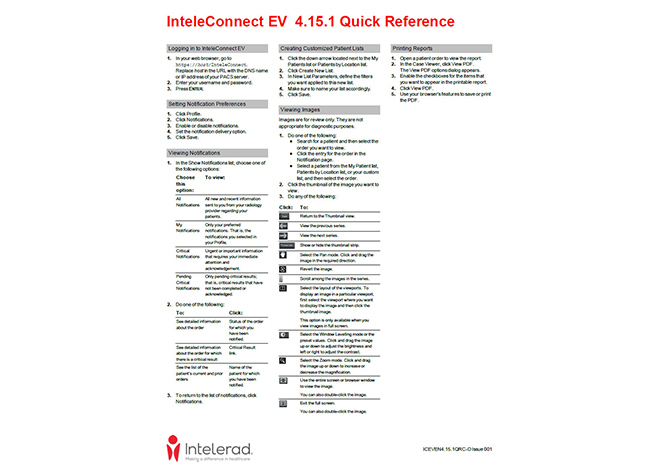 Intelerad typically releases updates to its software twice a year, which means the team is regularly writing and updating user documentation. Collateral material, such as conformance documents, technical notes, and quick reference cards are created as PDF outputs. In addition, online help is delivered as an HTML5 output. Because the company is based in Quebec, where French is the predominant language, Intelerad also has experienced a growing need for translation. Therefore, the team has utilized MadCap Lingo to translate user documentation to French. In addition, the team uses MadCap Capture to generate screenshots and create diagrams to support their documentation. The integration between MadCap Capture and MadCap Flare has allowed the writers to adopt the tool quickly, taking advantage of the similarities between the two tools’ user interfaces, as well as the short learning curve. “Learning Capture has been straightforward, and it has kept training simple,” Paquette observed. Since implementing MadCap Software’s solutions into their workflow, the team hasn’t looked back. One major benefit that the writers have experienced is consistency at every step of the documentation process–from development and management to final deliverable of output. Significantly, MadCap Flare has facilitated the delivery of documentation for its radiology workflow software, which needs to conform to a number of medical and technical regulations. Previously, Intelerad’s writers had to go through a laborious checklist, ensuring that each condition was set correctly before producing the output. Now with MadCap Flare, the team can trust that conditions are set properly, regardless of who goes in and changes the project. In addition to conditions, the team also has made extensive use of snippets and tables of contents (TOCs) in Flare, further enhancing their ability to ensure consistency throughout their documentation. Because we can depend on Flare to produce reliable, consistent results, it saves us so much time. Every mistake is costly to fix, but with Flare, we’re able to save money and get better results for our clients. With its topic-based approach, Flare also has simplified the way writers collaborate with each other, streamlining communication between the team. It has been a welcome departure from the previous method where they coordinated verbally to minimize overlap on projects. From the beginning, a key advantage of MadCap Flare that stood out to Intelerad was the simplicity and flexibility of the tool, including the use of plain XML and HTML. And as the writers focused on innovation, they were always looking for ways to improve their documentation and minimize errors. One of those efforts has been to write a standalone tool called FlareLint. FlareLint quickly scans a Flare project and ensures that it meets the company’s style guide requirements. Designed as a complement to MadCap Analyzer, the tool has allowed the team to optimize their review and approval process by examining documentation created in MadCap Flare for style errors. The writers at Intelerad have also released their free-to-use FlareLint tool to the MadCap Software community, under an open source license. They view the release as a way to encourage open collaboration among technical writers. “We want to give back to the people who helped us and answered questions selflessly over the past year, and making our FlareLint tool available to other MadCap Software users lets us do that,” Paquette says. Flare does what software should be doing in the first place, and we look forward to seeing how we can continue innovating with MadCap Software. The responses from Intelerad’s clients have been positive as their online Help evolved from simple HTML viewable on a web browser to a professional layout from Flare. The results from MadCap Flare have been a welcome change to internal audiences as well. The team has also seen tangible benefits with their workflow, primarily in reducing the time to produce outputs. Previously, it would take nearly two weeks to create and build an HTML5 target. However, Flare has allowed the team to automate much of the production and review process, cutting project time by more than 50 percent. Looking ahead, the Intelerad team plans to take further advantage of MadCap Flare’s flexibility, as well as switch to a version control system that will allow them to automate the rest of their workflow. The goal is to reduce the production time down to a few hours, giving writers more time to create content and address their users’ needs.